If the only writing you do is with a pen, instead of reading this post about blogging, you may prefer an article I wrote exactly a year ago: The Sharpie Marker, An Indispensable Modern Convenience. If you have been following the most - - of every moment for long, you will have noticed some changes to this blog over the past month. - the title banner is now a collage of photos. - the photos in my posts are larger than before. - I'm now publishing my recipes with a “printable version” available. A few people have asked me where I learned to do these things. 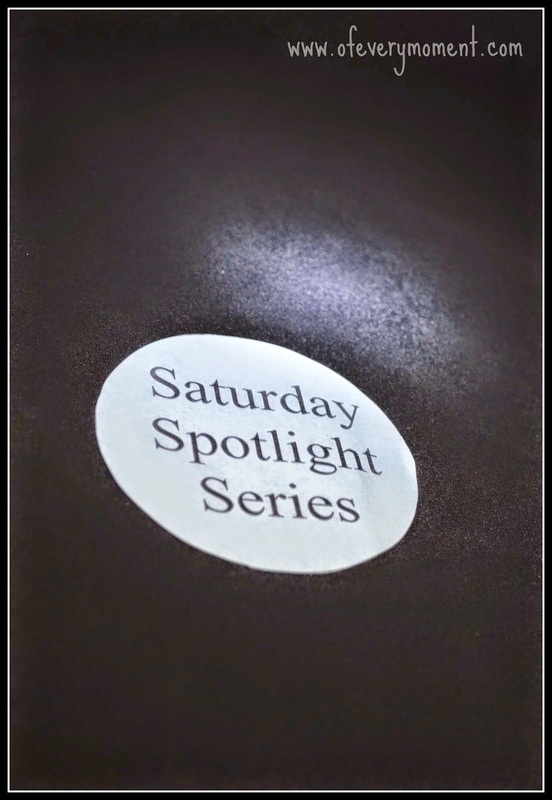 I am going to “shine my Saturday Spotlight” on my answer, which is . . .
. . . practically everything I know about blogging I have learned from other very supportive bloggers! Bloggers are an amazing community. On some level we are all competing with each other for readers. Yet, rather than selfishly just promote our own websites, bloggers really tend to help each other out. And from what I have learned, the more a blogger helps others, the more quickly that helper's blog actually grows. Thank goodness for Pinterest! Using Pinterest is like keeping a huge scrapbook. I have a “Blog Tips!” board stuffed full of links to helpful articles. I am constantly pinning valuable information that I find. Without these tutorials written by other bloggers, I wouldn't have known how to do anything at all when I first started blogging! In the year since I began this blog the most - - of every moment, I have received far too much help to give credit here to everyone who deserves it. I can at least tell you though, how I learned to make the recent changes I mentioned above. Perhaps you will find these tips helpful too. Although I use the photo editor Ribbet instead of PicMonkey (and therefore didn't follow the tutorial exactly), the post How To Make Headers For Your Blogger Blog - Using PicMonkey from The Blog Guidebook provided exactly the motivation and information that I needed to create my blog header. My blogger friend Heather (heatheronhertravels.com) gave me a tip about how to change the width of my photos before inserting them into my blog. I then realized that on the Blogger platform, photos can be published as "original size" (somehow I had never noticed that before?!) ... and in Ribbet, photos can be changed to a size that works! I found the post Auto-sizing Photos to Fit Post Area In Blogger by I Can Build A Blog really helpful. I'm too nervous to make any changes to the CSS code of my blog, but these tips worked well enough without having to do that right now. I have always offered an option to print any part of my blog (once you click on a post title, the print button shows up under that post). This method still seems a little cumbersome for recipes though, so I was thrilled to discover the post How to Make Your Recipe Printable on Blogger by Confessions of an Overworked Mom. It was a really easy tutorial to follow, and I like the print option I can now provide. I hope you do too! I had been toying with switching from the Blogger platform to Word Press. I really like Blogger, but I was feeling limited by my inability to do some things on it. 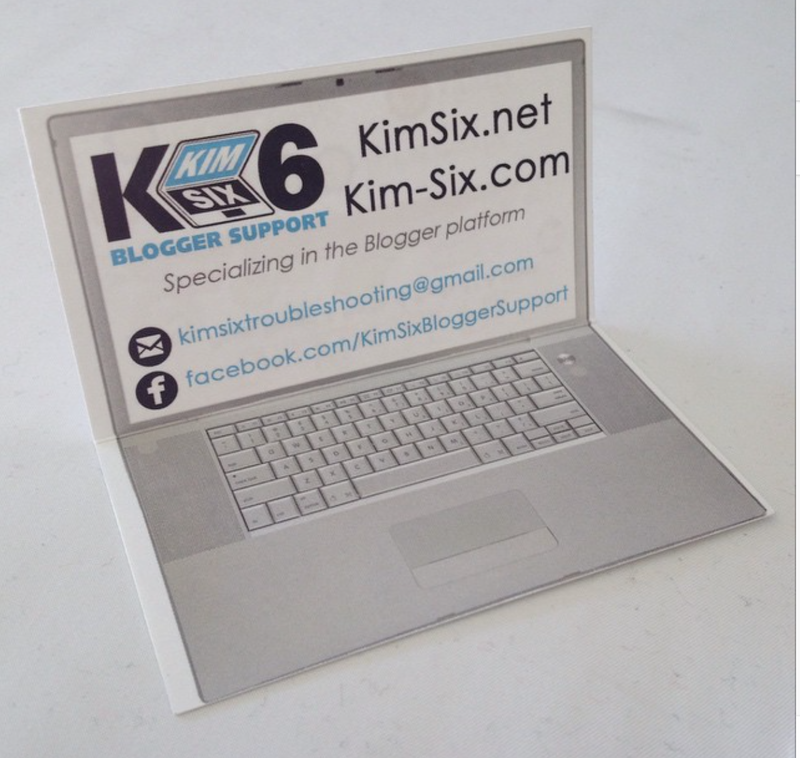 A couple months ago though, I discovered Kim Six Blogger Support. 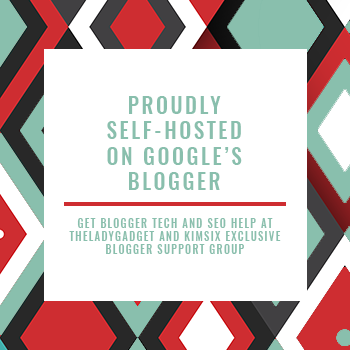 Kim specializes in the Blogger platform, and at the time was offering to do free blog reviews for blogs hosted by Blogger. I signed up immediately - and her review was unbelievably helpful and detailed. I have implemented a lot of her suggestions, and I am looking forward to working with her to get a little help with some changes I am unable (or too intimidated!) to do myself. Thanks to Kim, at least for now I am perfectly content to remain on Blogger! She just had new business cards made, and she posted a photo of them on Instagram. Pretty creative, don't you think? To everyone who has ever given me any blogging advice, information or support - I'd like to express a huge thank you! I hope I can pay it forward. What is the best tip from another blogger that you have ever received? Did you remember to click the link and read my previous post about Sharpie markers? I learned a lot of fun facts about them when I wrote the article. They can be used for all sorts of things; I even used one to make this wallhanging. It has been quite a while since I’ve published any fiction. Today I am participating in this week's Words for Wednesday challenge. I love the task of taking the six words provided by Delores from Under the Porch Light, and turning them into a story! While writing this one, I think perhaps I was sub-consciously thinking about the spring cleaning I need to do. Morning could not come soon enough for Mindy. She had to end this suffering! The self-imposed shopping moratorium that she had placed upon herself had lasted long enough. Four whole days without buying a single cleaning product! Since she was eleven-years old, this was the longest she had ever gone without buying something that cleaned, sanitized, shined, disinfected or removed dirt. She usually bought at least one thing every single day! The memory of the first cleansing product she ever bought was still vivid. Her mom had refused to buy the shampoo the television commercials recommended, because it was so much more expensive than their regular brand. Mindy had walked to the store and purchased a bottle of it herself, with some of the money she had gotten for her eleventh birthday. That first whiff of the shampoo's heavenly herbal essence had given her a feeling of fulfillment like nothing Mindy had ever experienced before in her young life. The next day she bought soap. Then a new brand of toothpaste. From there, it morphed into not just items related to hygiene, but cleanliness of any kind. Scrub brushes, make-up remover, toilet bowl cleaner, vacuum cleaners, rug shampoo, dishwashing detergent - she had to have them all. And not just one of each, but a multitude of every brand. Mindy knew she was a spendthrift and that she could ill afford the multitude of purchases she made. She knew most people didn’t own nine vacuums - or squirrel away 167 boxes of bath soap in their basement. In fact, in a flash of insight, last week she had realized that although she owned all of these cleaning products, her house and body were a far cry from immaculate! Practically every inch of space in her home was taken up by these purchases. Even her bathtub was filled with a miscellaneous assortment of unopened bottles, bags and boxes. Removing them from the tub and stacking them all on her bed (the only empty space left in her house) took so much effort that she never seemed to have much energy or desire to bathe. Mindy decided there was no reason to wait until morning. She hopped out of bed, fired up her computer, and ordered a Steamfast Multipurpose Steam-Cleaner from Amazon.com . Why hadn’t she thought of this before? She didn’t care about any of the cleaning stuff after she got it home. She just loved to make the purchases! Who knows - she might even end up making money instead of spending it! This story is totally fictitious! It is not even loosely based on any event or person, but is a fiction story sparked solely from the word prompts provided for this week's Words for Wednesday Challenge. I wonder if Mindy's new purchase was a good buy? I shamelessly including several Amazon Affiliate links to cleaning products in this story. It was easier to use them than take my own photos for this post! I fear a little of Mindy rubbed off on me - I don't own a Steamfast Multipurpose Steam cleaner like the one in the last photo - but after reading the reviews, I am a little tempted to try one out! It does sound like you have to follow the directions, and use extreme caution because of the steam - but I wonder how well this machine works? immaculate, moratorium, flash, spendthrift, miscellaneous, and squirrel. What are your thoughts about Mindy's new plan? Do you own a multi-purpose steam-cleaner? Note: In the spirit of full disclosure, this post contains Amazon affiliate links, for which I may receive compensation if any purchases are made. All opinions expressed, however, are entirely my own. I promised that I would be publishing my recipe for Frozen Mocha Cheesecake today. So now, I am keeping that promise! In my post yesterday, I wrote about a meal I recently served to some friends. Everything was quite simple to make, and almost the entire meal preparation could be completed in advance. Sometimes it can be hard to know what to serve with a new recipe. Without ever having tasted it, choosing complementary side dishes can be difficult. I was very pleased with my selections this time, and I quite possibly might make the entire meal exactly the same way again! We served a dry Riesling with dinner. For more information about the appetizer and main course, go to yesterday's post An Easy Dinner Menu - Perfect for Company. But now - - - it's time for me to write about dessert! On Friday I was visited by a swarm of about 50 loudly buzzing bees, who seemed to be doing everything in their power to come in through our (fortunately intact) kitchen window screen. Their visit was so dramatic and brief, I described it in my post, A Mysterious Visit By Bees. What I didn't mention in that post is that I was cooking with honey in my kitchen when the bees appeared. Trying a new recipe isn't so risky, when you trust the source! Some friends were coming over for dinner that evening. Like I often do, I was taking a risk and preparing a recipe I had not tried before for my guests. Bugs ... and Bees, Oh My! I'm sorry. My apologies to anyone who doesn't like to think about bugs! I promise bugs won't become a major topic on this blog, but I am writing about them for the second time this week. Yesterday was a lot busier than I had anticipated. The Saturday Spotlight post I had planned for today just did not get written. Instead - I am going to “shine my Saturday Spotlight” on a mysterious encounter I had yesterday. Why did about 50 bees suddenly swarm my kitchen window yesterday afternoon, for the better part of an hour? These bees were persistent and their buzzing was alarmingly loud! I was extremely glad they were on the other side of the window screen. I wish I had thought to take a photo before they began to disappear - or better yet record a video, so you could have heard them buzzing. Unfortunately, all I have is this photo, taken after many of them had disappeared. Note: if you are reading this on a mobile device, there may be large gaps after the text. Please keep scrolling down to view the entire post. Sorry for the inconvenience; hopefully I will figure out how to correct this issue soon! I have tried a lot of different recipes for rolled sugar cookies. A number of years ago, I finally found the perfect one! Most of the recipes you find on the Internet are actually published by bloggers. (I didn't ever realize this, until I became a blogger!) I wish I could remember where I copied this one from - I would love to give that person credit and personally thank them for such a perfect cookie! Flowers, pinwheels, dots and squiggles - just because! Photos from my daughter, with permission: Tired but Happy College Students! These cookies have amazing flavor on their own, but when frosted with my favorite sugar cookie icing, they become irresistible. I made a few alterations to the original recipes, and my son says they are now similar (“but better”) to the highly-esteemed ones at the local bakery! There are a few things that make these cookies really unique and special. Instagram is one of my favorite social media channels because it is uncomplicated, visual, and easy to scroll through. I post a photo on Instagram nearly every day. If you aren't following me but would like to, you can just click here to go to my Instagram profile. Leave your own Instagram link in the comments below, and I'll follow you. "You may or may not see more about this on my blog sometime, depending on how it turns out!" Well - “it” did turn out ... and today I am excited to tell you today about this easy baking shortcut. This technique worked perfectly when I made up a batch of my favorite sugar cookies last week. Yesterday, I published photos of a mountain hike. Today I realized there is (unfortunately) more of that story to tell. . .
On our little hike, unknowingly, I picked up not one but THREE hitchhikers! You may be a little entertained (or grossed out) by this account of my misfortune ... but I hope this story also serves as a reminder of some things to know when heading into the woods this spring! Yes, TICKS. Plural. I recognized them by touch right away. Because, you see, I am no stranger to providing a ride and a meal for these little guys. I have done so too many times before. Of course, I tried to confirm my suspicions visually. Not easy, when the body part you are trying to see is directly behind your head and below the level of your eyes! I tried to use a hand mirror to see the refection in the mirror on the wall. Nope - no way these myopic / presbyopic eyes could focus well enough. One more bright idea - I tried to use my iPhone to snap a photo of them. I got a lot of interesting shots of the ceiling, my collar, the top of my head and my shoulders ... and this very blurry picture. Which was enough to convince me that it wasn't bubble gum beneath my hair. If you desire to see a clear photo of a tick, I wrote about them once before. Not everyone enjoys photos of these guys, so rather than re-post the picture I took about a year ago, you can visit my post Do You Feel Lucky to Live Where You Do? and see a bigger-than-life clear picture of one there! Ticks come with the territory when you are in the wilderness in the springtime. The day of our hike was warm, but I must admit the thought of ticks never crossed my mind, as March is still really a winter month here. I'm not particularly squeamish - but I prefer not to share my blood supply with these nasty little mooches. And I especially would like to avoid any diseases that they may carry. Once discovered, it is my preference that they vacant my premises immediately! Herein lies the problem. How do you use tweezers to gently grab and pull a tick STRAIGHT out, without leaving any parts behind, as the CDC emphatically recommends ... when you can't see where you are tweezing?! This was a problem I could not solve myself. A text was immediately dispatched to my husband - most of it composed in upper case letters! I got a sympathetic reply almost immediately. "Do you want me to come home." " Do you have any time today?" No text response. Feeling uncharacteristically like a damsel in distress, I kept waiting for my knight on a white horse to appear - but things at work must have gotten hectic for him. While waiting to hear back, I tried to inspect the dog. No ticks on her that I could find, but with her thick coat they could easily be hiding. We will check her over from time-to-time for a while! I will also have to let my doctor know if I develop any symptoms of rash, fever and chills, headache, unusual fatigue or muscle/joint pain in the next few weeks. These could be an indication that one or more of my pesky uninvited guests shared with me a tickborne illness. Double UGH. "I could bring alcohol and tweezers and meet you at work. Or maybe I will call some friends and see if anyone is willing to do an extraction. My sanity is ebbing a bit with three heads buried in my neck." Just as I was deciding which friend would be most competent and comfortable performing this favor, I got an text response from my spouse. "So sorry - couldn't get away. I'm coming now." Knights in shining armor don't always just fight dragons! Sometimes, instead of a white horse, their steed is a Honda Pilot! I decided to post a photo after all. All three ticks were skillfully removed by my husband and met their deaths in a jar of alcohol. It was a case of murder which I wholeheartedly endorsed! Have you ever had a tick on you? Do you have a tick story to share? I usually don't post on a Monday, but my news just can't wait until tomorrow! As I begin my second year of blogging, today I'm publishing my 300th post on this blog! You may notice some changes to the banner, fonts, and layout of this website. I gave the most - - of every moment a bit of a face lift over the weekend - and there will be more changes coming! I'd love to know what you think so far! Last Tuesday I wrote about my heavenly weekend in California. I mentioned that I would soon have another article about it published on the blog Heather on Her Travels. It was posted Saturday! I am so honored for my work to be published on Heather's wonderful and well-read travel blog. I hope you will take a minute and click here to read A weekend getaway at Hotel del Coronado in San Diego. It is quite different from the article I posted on this blog last week, with photos of my friend and I enjoying the activities nearby! Be sure to take a look about Heather's informative blog Heatheronhertravels.com, and read about some of her exotic travel destinations! 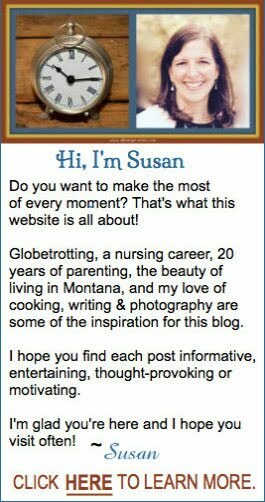 Her blog is fun to follow because she lives such an exciting life! The weather over the weekend tried to fool us into thinking it is Springtime in Montana. It clouded up a bit on Sunday and got windy - but it was still a perfect afternoon for a hike. My weekend was fun and quite productive. Note: In the spirit of full disclosure, I did receive some complementary services from the Hotel del Coronado. All opinions expressed, however, are entirely my own. There are 525,600 minutes in a year. I hit publish for the first time on this blog five hundred twenty-five thousand six hundred minutes ago, give or take a few. I had absolutely no idea what I was getting into! A year and about a weekend ago, I had just one question: “What's a blog?” Seriously, I didn't even know. A blog, for anyone who many still not know, is a regularly updated web page or website. The word “blog” comes from the term web log or weblog. It also may interest you that each update is called a "post" or a blog post. Today, I can answer that question, but now I have a bunch more! First - some exciting news. Well, at least I am excited about it! This blog - the most - of every moment is One-Year-Old tomorrow! A snap-shot of my first blog post! To read it, click here. My "Blogiversary" has been sort of on my mind lately, but I had an “aha moment” about it today! While thinking about St Patrick's Day coming up next week, I realized that I have already written a post about that holiday!! It was one of my earliest posts, but WOW - I truly have been blogging for a year! When my children were small and had birthdays, people would ask me what to give to them. I always felt a little uncomfortable about providing any ideas. It feels a little awkward now as well, but just in case anyone is wondering about a birthday present for my blog - I have an suggestion! remember to respond to the confirmation email you will receive. By doing this, you will never miss a post - and your email address won't show up anywhere on this blog - I promise! NOTE: (I have a Facebook Page (different than my personal profile) set up specifically for this blog. Please be sure to “like” the Facebook Page “the most - - of every moment” itself, not just a particular post - although I'd love it if you'd “like” those once in a while too! 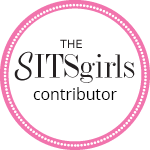 If you are already following this blog - a huge thank you! That's enough about my blog's first birthday until tomorrow. In the meantime (today being my 365th day of blogging) I am simply going to update that earlier post about St. Patrick's day! When writing that post nearly a year ago, I provided a link to a St. Patrick's Day article I wrote for Yahoo Voices. Since Yahoo Voices is no longer in existence, I am sharing that information again here, and linking it back to my original blog post. You can read the rest of the original post right here. I originally intended these St. Patrick's Day suggestions for families with kids - but people of any age could enjoy at least some of them. Places, like people, become important in our lives. Yesterday, I published a post about how I have been feeling homesick for a hotel. Today, I am in mourning. Not for the first time, but much more profoundly than before, I am lamenting the loss of a pool. I know that every parent who's ever had a child on a swim team is certain to understand why I am grieving. My children were born in Ohio, and their early years were spent there. We belonged to a club with an outdoor pool, where we spent a multitude of happy summer hours. Although there were some earlier swimming lessons at a YMCA, it is this pool my daughter remembers as the place she began to love to swim. On a visit to Ohio years later, we stopped in to “see the pool.” To our horror, we found the club to be in disrepair. There were broken-down buildings and many symptoms indicating that it had not been used for recreation for quite some time. The pool was fenced - but beyond the padlocked gate it was visible with brackish sludge and a foundation that was clearly cracked. Despite the fact that there were no longer any reasons for us to ever swim in that pool, I felt sad. My daughter cried. The pool where my family (and countless others) spent ten-thousand-plus swim team-related hours is now closed. Permanently. Reading the news was like reading the obituary of an old friend. This time, it was not just my daughter who shed some tears. Today I’m excited to tell you about a wonderful resort, where a friend from college and I recently spent a fun weekend together. I received complimentary services from the hotel in exchange for writing about it, but the opinions expressed are entirely my own. I've never believed that heaven is a place where angels rest on fluffy white clouds, having seen from airplane windows that clouds are just unsubstantial wet mist. I'm convinced the location of the "hereafter" must be something better -- perhaps a conglomeration of all of the best times and places that we've experienced in this life. I would be quite pleased, in fact, if it replicated the luxurious and beautiful Hotel del Coronado. The Hotel del Coronado, or "The Del" as it is often fondly called, is a luxury resort just across a bridge from San Diego, California. Coronado has an “island feel” although it is actually a peninsula, connected to the mainland by a thin spit of land called the Silver Strand. A friend and I chose Coronado from various flight destination options for the location of our “girl’s weekend away” last month, because of the beautiful beach, warm weather, and the activities available there. We deliberated about the cost, but we finally decided that Hotel del Coronado was worth the splurge. I am so happy that we did. Hotel del Coronado is a National Historic Landmark. A curious visitor just stepping off the beach for a look inside, however, might not immediately grasp its impressive character. After entering the dim lobby from the brilliant sunlight that illuminates the sparkling blue Pacific Ocean and red roofs of the buildings, it takes one's eyes a few minutes to adjust. Unless a person stays long enough to allow their pupils to dilate sufficiently, they will miss the intricate features of this beautiful lobby. The ornate wood details, the heavy chandelier, and the brass cage of the elevator shaft (still operated by a “bell person” in an outfit I suspect has changed little since the 1920's) are all gorgeous. The whole main building gives a feeling of having entered a place of old-world charm. I was only a guest at the Del for a long weekend, yet I now find that I am homesick for it. I grew fond of the beautiful buildings and became fascinated by the history associated with them. I loved stepping off the hotel grounds right onto a beautiful beach. Taking advantage of the rejuvenating services offered by the spa was blissful, as was participating in activities such as a yoga class at the water's edge. When relaxing at night in one of the restaurants or in a comfortable chair near a fire pit, real-world responsibilities seemed to disappear. It was so easy to fall asleep in a comfortable bed while listening to the sound of the surf through the open balcony door. Unlike many hotel rooms with poor lighting, there was even a small reading light provided at either side of both beds. The bathroom was tiny, but all features had been updated and no detail overlooked, right down to the hotel seal on the extra roll of toilet paper! When the Hotel del Coronado first opened its doors in 1888, it was a grand and glorious hotel resort. Located in the still vastly unsettled wild west, it was inaccessible except by train, and affordable only by the wealthy. The resort weathered the years of the depression, World wars, and the post-war era. Guests have included numerous American Presidents and British royalty. The author of The Wizard of Oz, L. Frank Baum, was a frequent guest and has been credited for the design of the beautiful chandeliers in the dazzling Crown Room. The resort has been both a movie set and a place to stay for a variety of movie stars and movie makers, including Marilyn Monroe, Jack Lemmon, and Tony Curtis during the 1958 filming of Some Like It Hot . A $13 million renovation of the resort was just completed in 2014. Some people believe one early guest never left the hotel. A young woman named Kate Morgan checked into the Del in 1892. Five days later she was discovered dead on one of the hotel's exterior staircases, of an apparently self-inflicted gunshot wound. Her spirit is said to continue to inhabit the hotel and her ghostly pranks are reported from time to time. It seems possible to me that after dying at the hotel, a spirit could easily mistake those surroundings for Heaven! Perhaps that is why she just never felt the need to leave. My friend and I did leave and returned to our homes in Montana and Virginia. We have already agreed, however, that the Hotel del Coronado will be the place for our next reunion. If you are interested in learning more about the Hotel del Coronado and its history, there is a wealth of information on the hotel website, or in the book Hotel Del Coronado: HISTORY, available from the Hotel del Coronado Retail Department. I referred to both, as I checked my facts while writing this article. I had already drafted this article when I read (in the book mentioned above, page 194) that L. Frank Baum once compared the Del "to heaven itself." I guess I wasn't the first person to have had that thought! Have you ever stayed at a historic hotel? Was your visit enhanced by the history of the place? In addition to this article, I will have a guest post published later this month on the travel blog, Heather on Her Travels. It tells more about the weekend my friend and I spent at the Hotel del Coronado, and our adventures while exploring San Diego. I hope you will click here to read my guest post and visit Heather's wonderful blog. Note: In the spirit of full disclosure, this post contains affiliate links, for which I may receive compensation if any purchases are made, and I did receive some complimentary services from the Hotel del Coronado. All opinions expressed, however, are entirely my own.